The chase continues! Caught in the park… Ya know what? I’m not even going to bother. It’s the same as last issue. They chase each other. The vile gets tossed around. They chase some more. Meanwhile, Montoya does detective work. It’s really repetitive. I’m only halfway through this series, and I’m bored. This should have been a two-parter at best. Nothing happens! Still erring on the side of cartoony. Acceptable, but not great. Oddly enough, this one makes specific references to ‘Mad Love.” So now we know this story is set sometime after those events. 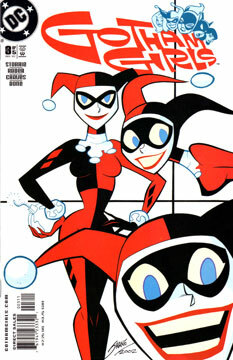 Well, aside from the usual, there’s a “sugar buzz” Harleen, but that’s a deep dive into obscurity. I know I’ve said “If you’re in for one, you’re in for all,” but now I’m starting to doubt.